Firefox users who are affected by these issues may want to upgrade the browser to the new version to fix these issues. The release is not critical for users who don't use these services. 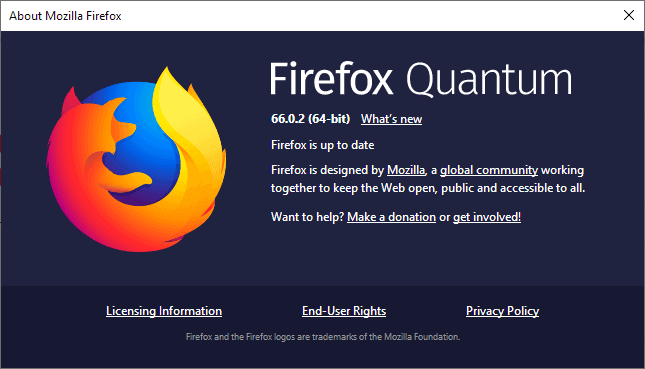 The new Firefox 66.0.2 version fixes crashes and a web compatibility issue with certain online services such as Office 365 or iCloud. Mozilla is winning the update race with MS! Will they get to one ver. 66 update every three days before Mar 31? Will the Evil Microsoft, never to be upstaged, buy Mozilla and drop them into shark infested waters never to be seen again? Stay tuned, same Bat Time, same Bat Channel! Has anyone figured out how to get the “DisableAppUpdate” policy working again after the 66 update? It worked in 65. Never mind, it’s the comment system here that messes up the indentation. Firefox used to have the new tab page when set to blank to be black with the dark theme. Since Firefox 65, the new tab is white. Does anyone know if they are planning on fixing this? I do not use these services, run Win8.1, have seen no issues but yes the 0.2 update has been pushed out to me already, installed. No problems as of yet, don’t anticipate any. So, the new FF 66 version introduced regressions that have to be fixed with FF 66.0.2. Something will usually go wrong when Mozilla upgrades FF every 6-weeks which is an exact copying of Google Chrome’s rapid upgrade schedule. This is because Mozilla Corp has much less resources than Google Inc.
……. It will likely be better for Mozilla to drop back to a quarterly or half-yearly upgrade schedule and not over-extend themselves. Since Mozilla Firefox likes to copy Google Chrome, maybe she should also follow M$ Edge and adopt the Blink engine of Google’s Chromium Project, ala Opera, Vivaldi, Brave, etc. minor, non security related updates like this should not be pushed. let it be an option. I am noticing a slight slow down with this version and some sites take forever to fully render notably facebook..i primarily use palemoon browser and it seems to handle facebook better.Not certain if noscript could also be an issue. Firefox doesn’t know how to open this address, because one of the following protocols (ms-word) isn’t associated with any program or is not allowed in this context.